Need more space but don't want to move? 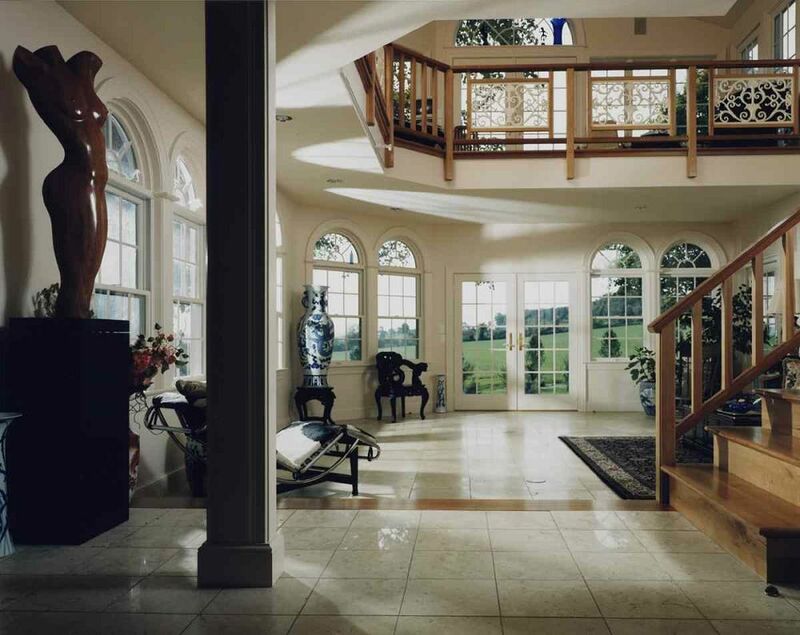 A custom addition tailored to your needs could be the answer. At McClurg, we'll help make your home addition special for you. 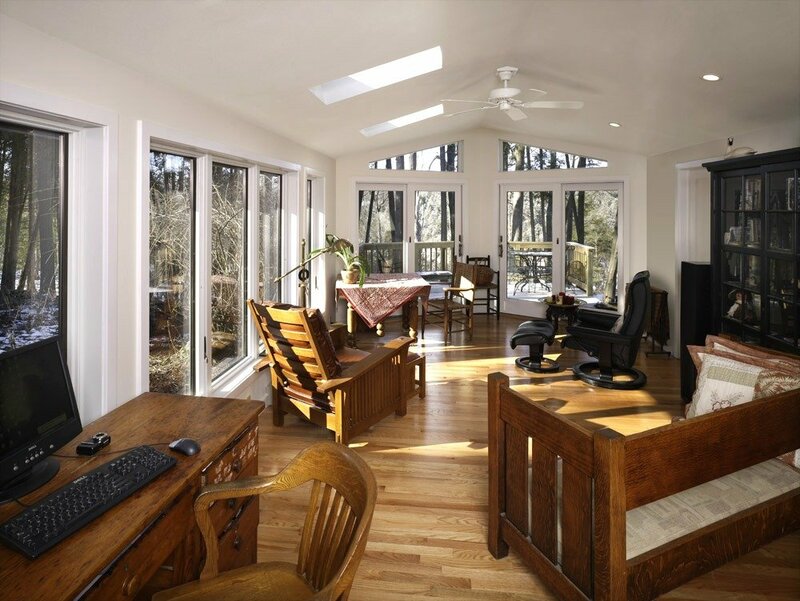 We'll listen carefully to your remodeling ideas, offer helpful suggestions and develop the best design solutions for your priorities and budget. Contact us today for a complimentary consultation. 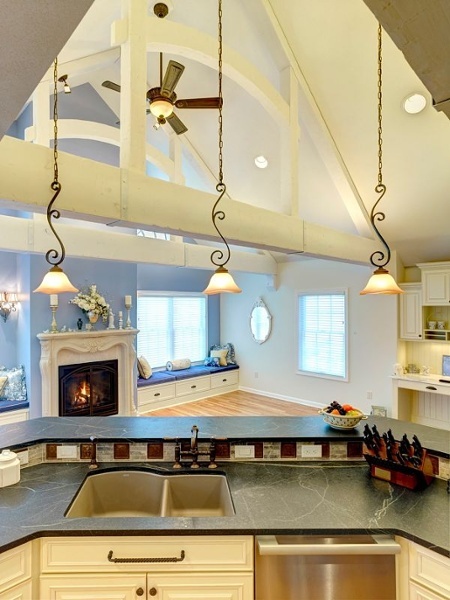 A large island is the centerpiece of this stunning and practical kitchen addition. 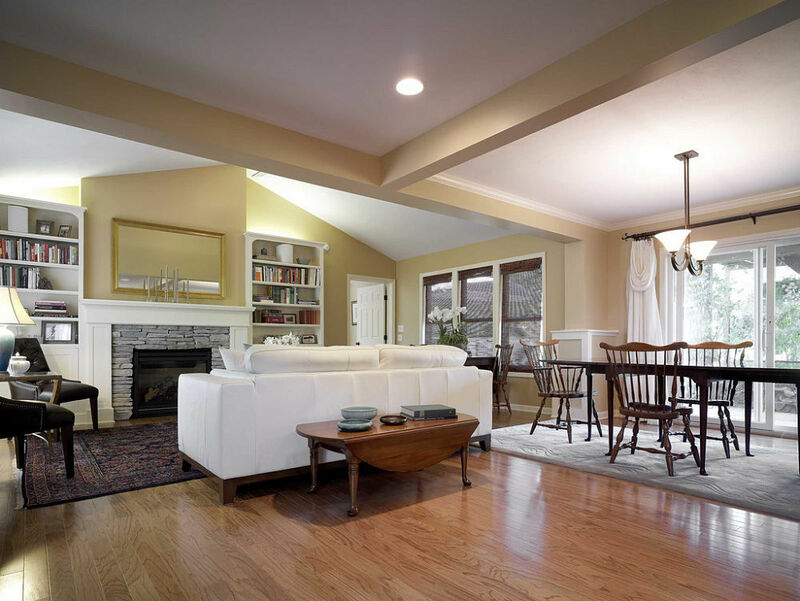 Three pendant lights illuminate the island and there is ample seating. 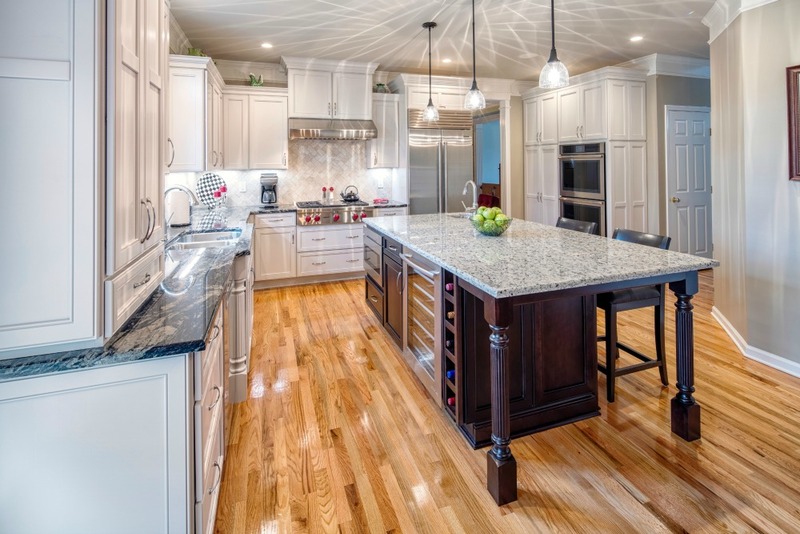 The homeowners selected wood stained cabinet base units and a white patterned granite countertop for the island to contrast with the painted white perimeter cabinets with black granite counter surfaces. The dimensional look in the kitchen is achieved by installing wall cabinets at varying heights and installing crown molding above the cabinets and on the walls near the ceiling. Cabinet panels were used to frame the wall oven (at the right of the photo) to add texture and balance to the design. This exquisite kitchen features an island with two paneled posts and pendant lighting for food prep and dining. 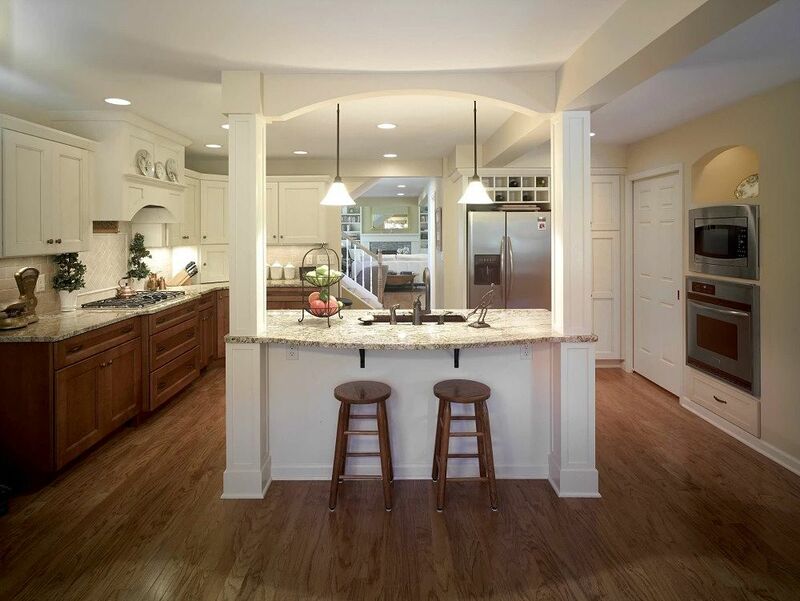 The posts not only complement the cabinetry but one conceals a load-bearing support. 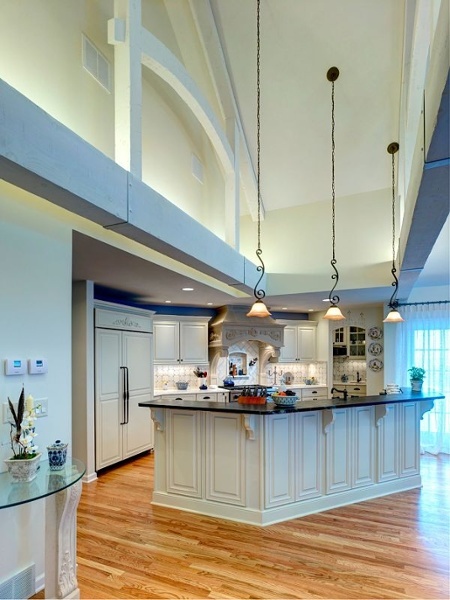 Other architectural features include an arch over the wall ovens, display shelving, crown moldings and a custom tile backsplash. Painted custom bookcases with adjustable shelving were built on each side of the gas fireplace. The mantel connects the bookcases and creates a focal point in the room. 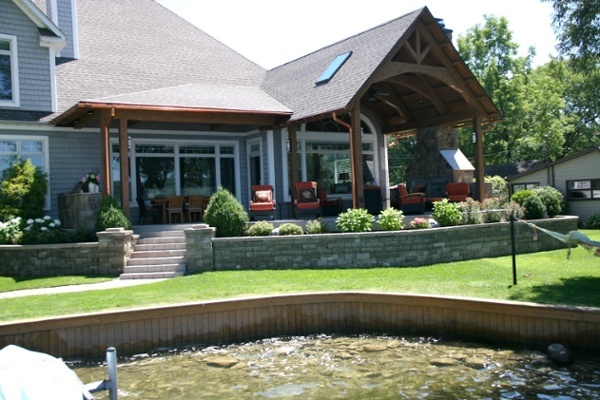 This open porch addition built onto a lake cottage provides a multi-purpose outdoor living space and a spectacular lake view. 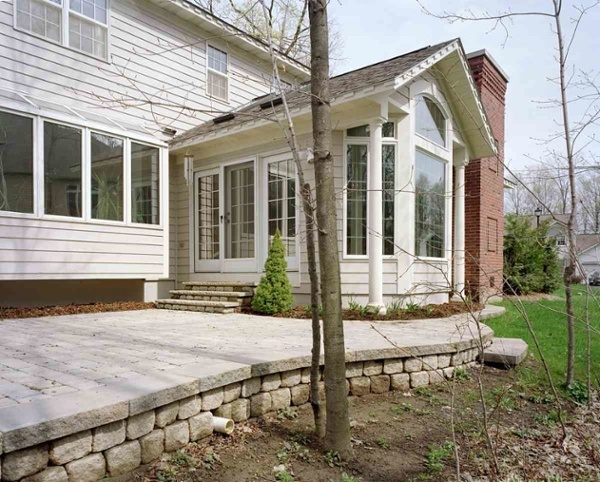 We also built the steps, pillars and reset the retaining wall to complement the addition. The gabled roof complements the shape of a large arched window and does not obscure the view of the outdoors. 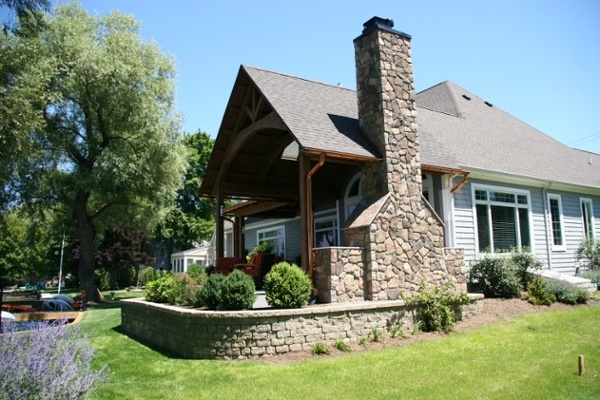 Boral cultured stone veneer was used on the chimney and the areas for built-in appliances and storage. Copper gutters were used for both function and aesthetics. 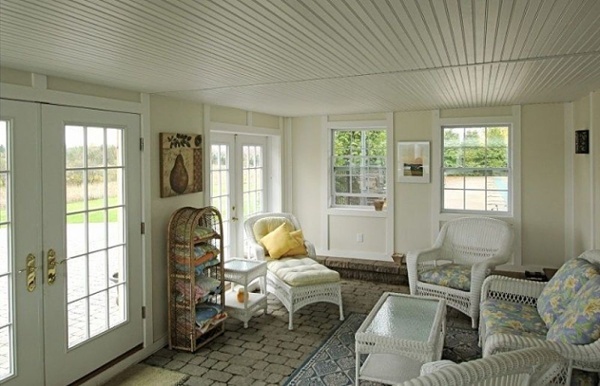 The exterior of this living room addition incorporates all of the existing exterior details, making it appear as if it was part of the original home. 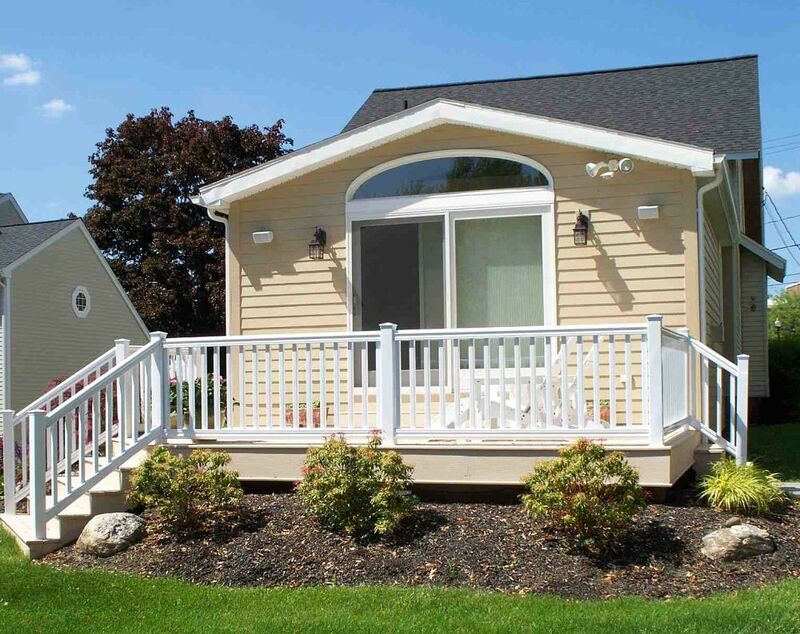 This two-tone maintenance free deck includes composite decking and trim boards accompanied by a vinyl rail system. 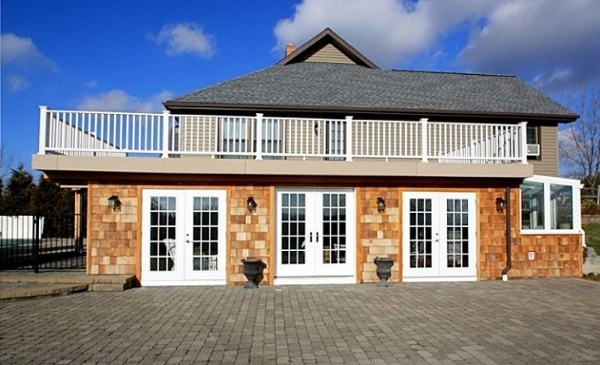 This addition is unique in that it features many different angles. Natural light floods the room through all of the windows and doors, including the skylights in the cathedral ceiling. The end wall is angled out and includes two trapezoid windows above. The marble floor, half-round topped windows and ornate trims add elegance and style to this unique two-story addition. 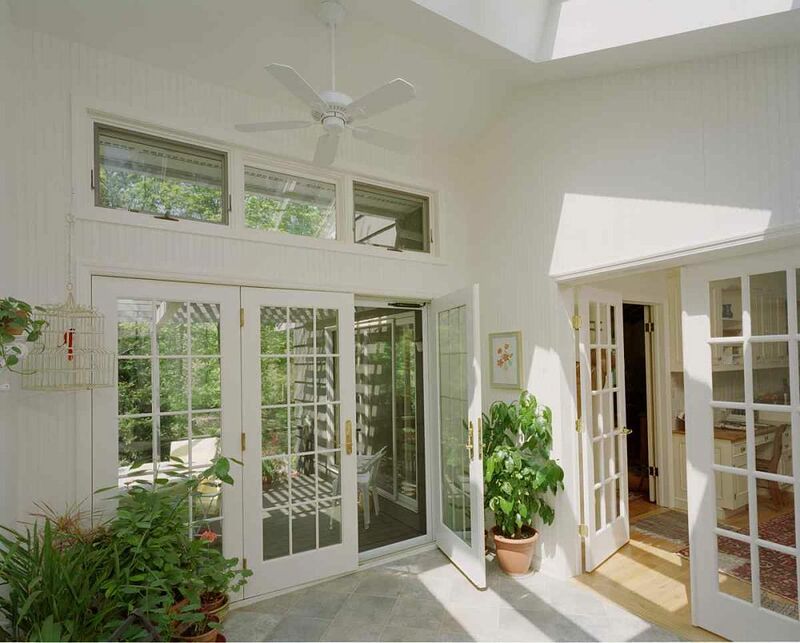 This breezeway addition provides natural light space and is an elegant transition from the main part of the home to the patio. 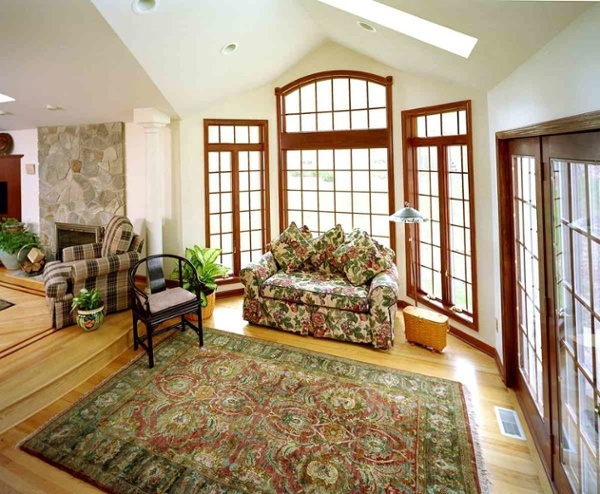 The step down to this living room addition/extension adds a new dimension to the interior space of this home. Large windows and skylights provide plenty of additional natural light. 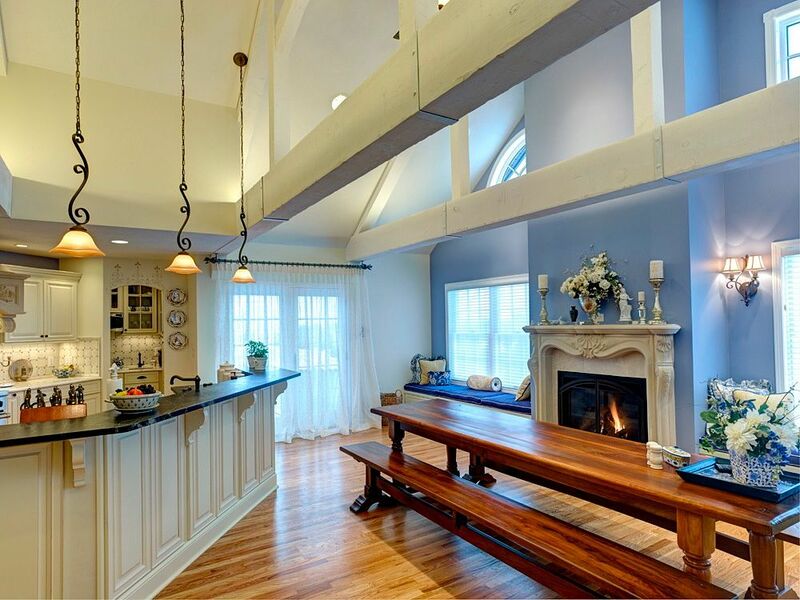 Among the outstanding features of this kitchen are its 15-foot high cathedral ceiling and hand hewn interior trusses spanning the 24-foot width of the room. 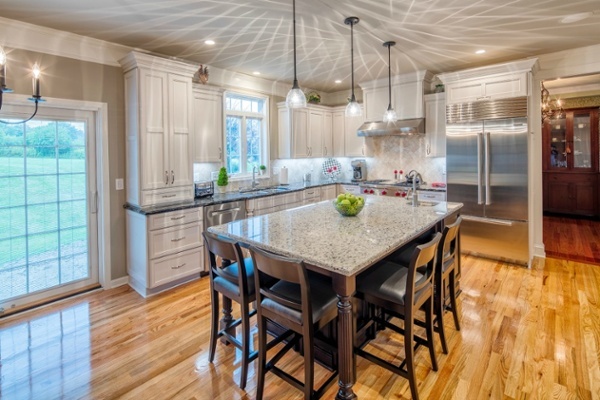 There are many options for lighting including recessed, pendants and under-cabinet. Hidden uplights on the top of the wood beams light the cathedral ceiling. The large tiered island has a soapstone countertop and custom tile backsplash. The island has areas for food prep as well as buffet service or additional seating. The deep granite composite sink is easy to maintain and functions well for washing vegetables, cleaning dishes and oversize pots and pans. The Old Stone Works fireplace mantel matches the range hood. The fireplace is a gas Heat and GLO 6000 series that has a remote control for every function including flame height, room temperature, and interior lighting of the firebox. False ceiling beams, 5-inch plank cherry flooring and a stone faced fireplace add warmth and interest to this large multipurpose room. 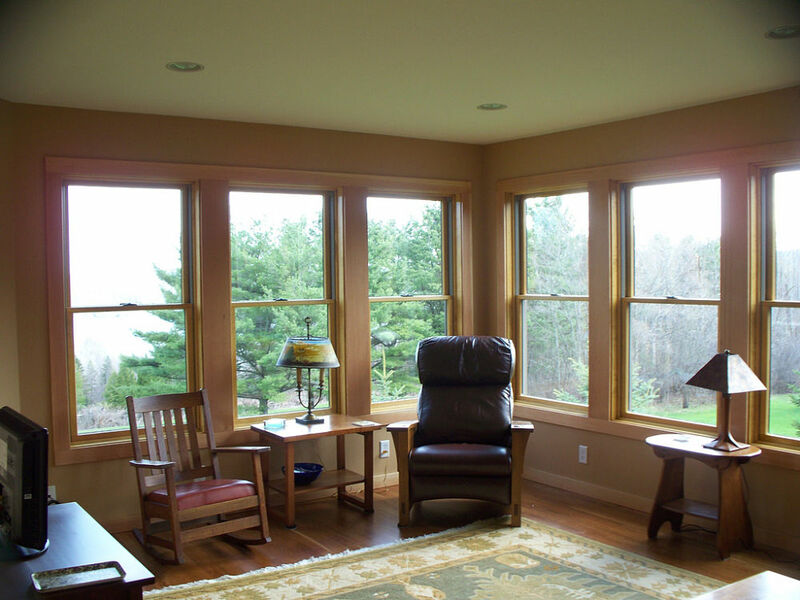 The walls of this addition were filled with windows to bring in natural light as well as open up a beautiful view of the lake below. This new living space provides a comfortable seating area and eating area that ties into the existing kitchen. 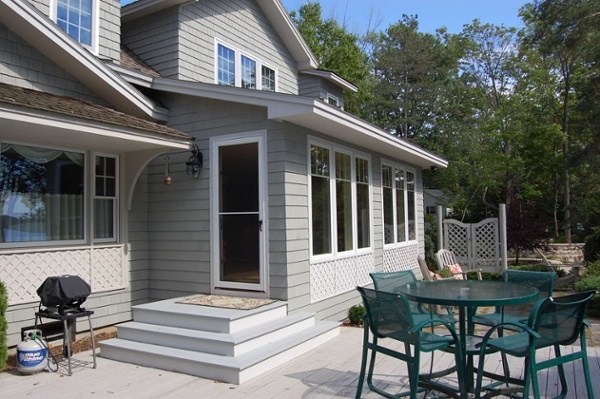 A composite platform and steps were used to transition from the door of the new addition to the existing cedar deck. 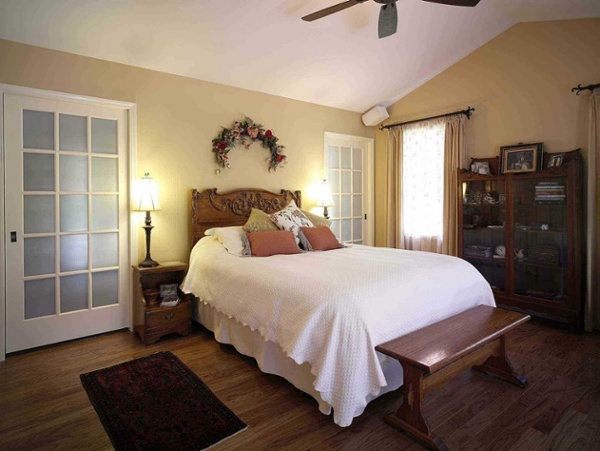 Cathedral ceilings and French doors add a nice design statement to this second story bedroom addition. Opaque glass in the French doors provides privacy to the bathroom and closet spaces. The hot tub room was built under an open deck area. To prevent rain and other elements from entering the room, we installed a new product – Trex® RainEscape® Deck Drainage System – under the existing deck boards. The room is enclosed with three 6-foot patio doors. The walls were framed and insulated with ridge foam. Exterior walls were covered with plywood sheathing and finished with cedar shake wood siding. The hot tub room was built over the existing paver patio and includes a large seating area. The ceiling was insulated with ridged foam and finished with white bead board siding. Exterior grade plywood was used for sheathing on the interior walls and painted white. The section of the room in the photo is enclosed with 6-foot patio doors and two double hung windows. The room includes rustic trims that echo the Country French interior design elements of the home, and casual outdoor furniture. 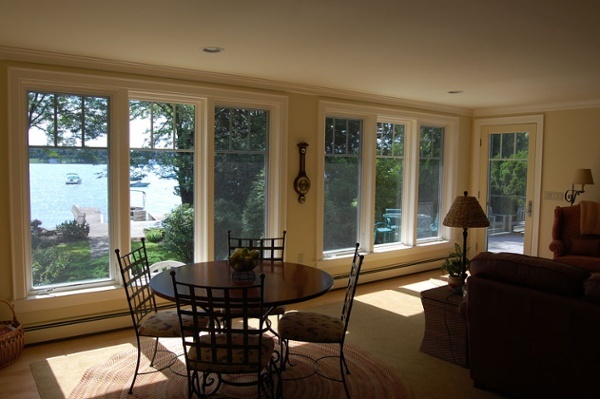 There is also a patio door that separates the room from the finished basement. 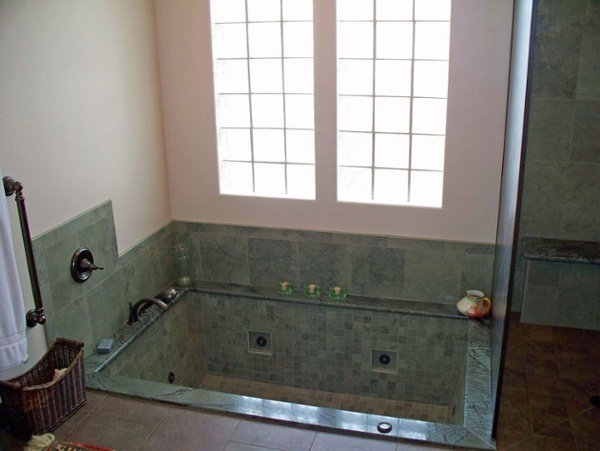 This 230-gallon tub was hand-made including its jet system. The recessed jets, granite surround and glass block windows add to the unique look and character of the tub, which recesses into the home's basement. 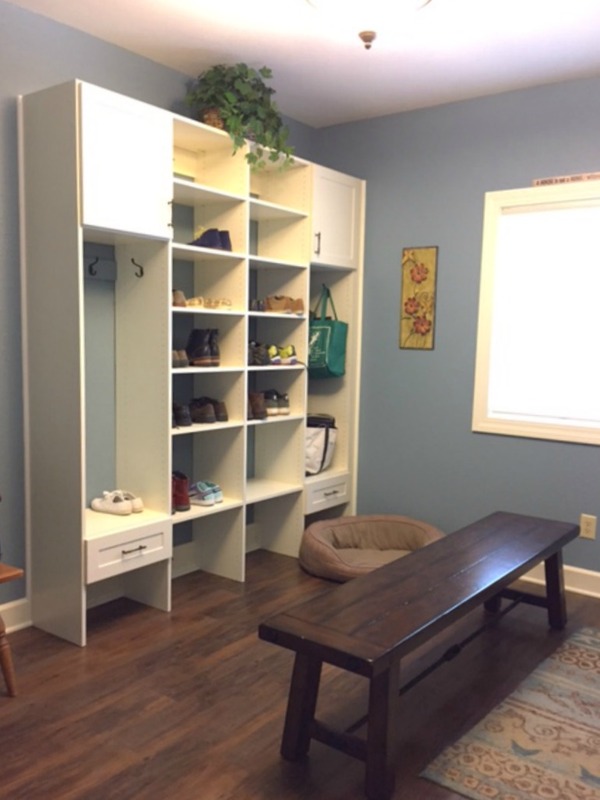 This mudroom addition provides organized storage for personal items.